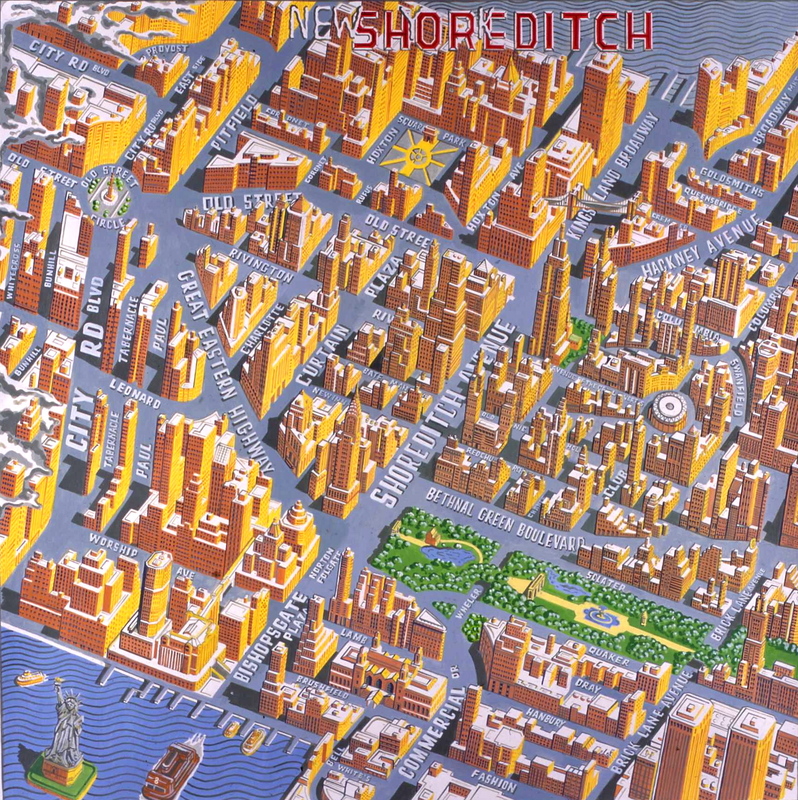 “People do say they like the New Yorky feel, here in Shoreditch,” admitted Adam Dant with a wily smile and a discernible twinkle in his eye, when I asked him how he came to draw this map of Shoreditch as New York. In this arresting vision, (A double click will enlarge the map to fill your screen) Old St roundabout is transformed into Old St Circle, Arnold Circus Park becomes Madison Square Gardens and Liverpool St Station becomes Grand Central Station. In this metamorphosis, the buildings and terminology are Americanised too, Brick Lane becomes Brick Lane Avenue, Bethnal Green Rd becomes Bethnal Green Boulevard and Quaker St becomes simply Quaker. Commissioned in 2003 by the Shoreditch Map Company, the original painting now hangs above the table football machine in Bar Kick in Shoreditch High St, where Adam and I went to have a look at it yesterday. Unsurprisingly, we were told it is the subject of a great deal of discussion in the bar. When you come to think about it, the comparison becomes less far fetched than you might assume, because Broadway in New York is along the line of an ancient pathway followed by the Algonquin tribe, whereas in Shoreditch, Old St follows the route of a primeval trackway of the ancient Britons, and Canal St in New York follows the route of the former canal whereas Shoreditch takes its name from the “Suer” that was once ditched and is now piped off. Both places are renowned for their mix of artists and immigrant culture, and down in Brushfield St, on the site of the Spitalfields Market, Adam has drawn New York’s Ellis Island building in acknowledgement of the immigrants who have come to New York and Spitalfields, defining the nature of these locations today. Looking around the neighbourhood, you quickly come upon further clues. We have Rivington St here just as they do, and Broadway Market and Columbia Rd too, chiming with New York. And the extension of the Great Eastern Railway up to Old St created a narrow triangular plot, occupied by a tall tapered building at the bottom of Great Eastern St which is reminiscent of the Flat Iron Building. Many people live in lofts in this vicinity today just as you might find in Soho or Tribeca and, of course, we have Shoreditch House whereas in New York they have Soho House, though I am reliably informed our rooftop pool deck is bigger than theirs. In Adam’s vision, the Bishopsgate Goods Yard is transformed into a park, something many residents would like to see. Wheler St crosses the yard beneath a bridge just as 79th St crosses Central Park, while the elevated garden upon the former railway arches that Adam has drawn resembles the Highline Park in Chelsea – and a similar proposal has been made here, to transform the continuation of the Bishopsgate Arches over in Pedley St into a raised park. On Sundays, you will find the Chelsea fleamarket in the West Village, and here in Sclater St and Bethnal Green Rd. In Summer months, young people fill Hoxton Square, just as their transatlantic counterparts fill Washington Square. 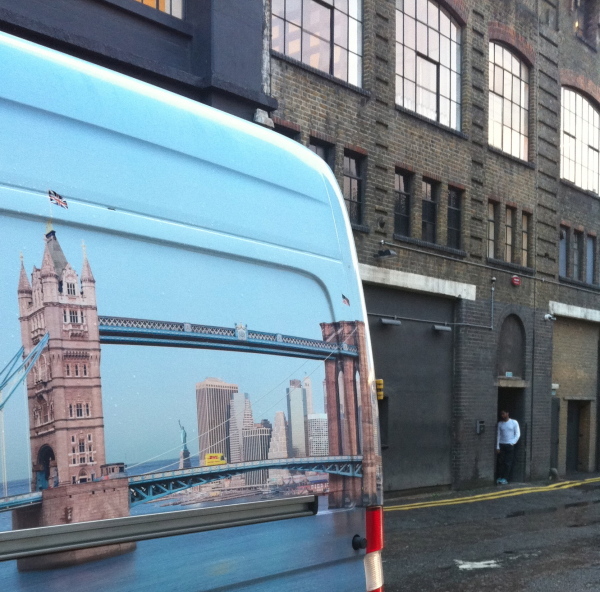 The courier truck in Redchurch St, is this London or New York? You may like to take a look at Adam Dant’s Map of the History of Shoreditch and his Map of Shoreditch as the Globe. Next time, Shoreditch in the Year 3000. Adam Dant’s current exhibition Bibliotheques & Brothels runs at the Adam Baumgold Gallery, East 66th St, New York City until November 27th.